Separatists fired with infantry fighting vehicle guns and a tank on Ukrainian army positions. Pro-Russian militants waged 51 attacks on the positions of antiterrorist operation (ATO) forces on 8 January, the ATO HQ has said on Facebook. In particular, in the Mariupol sector, militants shelled Shyrokyne, Maryinka, Hnutove, Troyitske, Vodyane, Talakivka, Pavlopil and Krasnohorivka with 122-mm artillery, 120-mm and 82-mm mortars, grenade launchers and small arms. They fired with infantry fighting vehicle guns on Maryinka and shelled Talakivka from a tank. 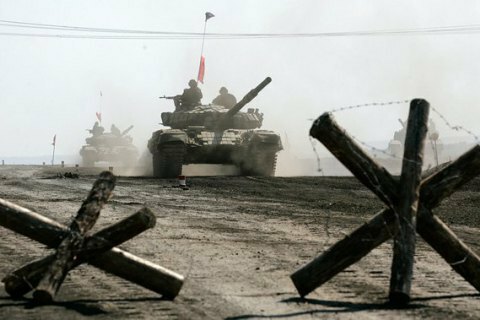 In the Luhansk sector, militants fired with mortars of various calibres, grenade launchers and small arms on Troyitske, Novozvanivka, Lopaskyne and Stanytsya Luhanska. In the area of Troyitske, an enemy sniper was active. In the Donetsk sector, the enemy targeted Luhanske, Avdiyivka, Mayorsk and Zaytseve with 122-mm artillery, 82-mm mortars, grenade launchers and small arms. Luhanske came under fire from an infantry fighting vehicle gun. In Donetsk Region, the body of a girl with shrapnel wounds was discovered on the road. The police said the woman was possibly killed as a result of a mortar attack by militants three days ago.